New Hatters keeper Jonathan Mitchell is hoping his side can bounce back from their 1-0 defeat against Crawley Town last weekend when they travel to Plymouth Argyle on Saturday. 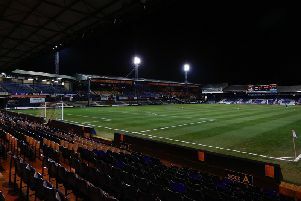 Luton make the long trip to Home Park having seen their slim play-off hopes take a dent with the Red Devils’ reverse. With 10 games to go, Mitchell knows it’s essential to go on another winning run immediately as he said: “It wasn’t exactly the start I wanted at Kenilworth Road, but that’s how its gone. “We’re very disappointed not to get the win, but we need to bounce back and hopefully get the win away at Plymouth. “When I came in, with three on the bounce and then we won (at Leyton Orient), it was a brilliant feeling as the lads were all buzzing. “So hopefully we can continue our previous form before this game (against Crawley), as the performance was actually brilliant, we just couldn’t score. Mitchell has been impressed with what he was seen from the Town side in his short stay at Kenilworth Road so far, continuing: “If we keep that performance up for the next 10 games then we’ll be in a strong position and if we keep playing like that, hopefully results will follow. “One thing you can’t do is look too far ahead though. “We know we had won four on the bounce, but we’ve got to take every game as it comes now, keep going, next step after next step.